As the Cincinnati USA Convention & Visitors Bureau informed on December 7, 2017 its long-time president and CEO Dan Lincoln will retire at the end of the year for health reasons. INTERKULTUR takes this opportunity to thank Dan once more for the strong support and partnership he has shown to our organization over years. 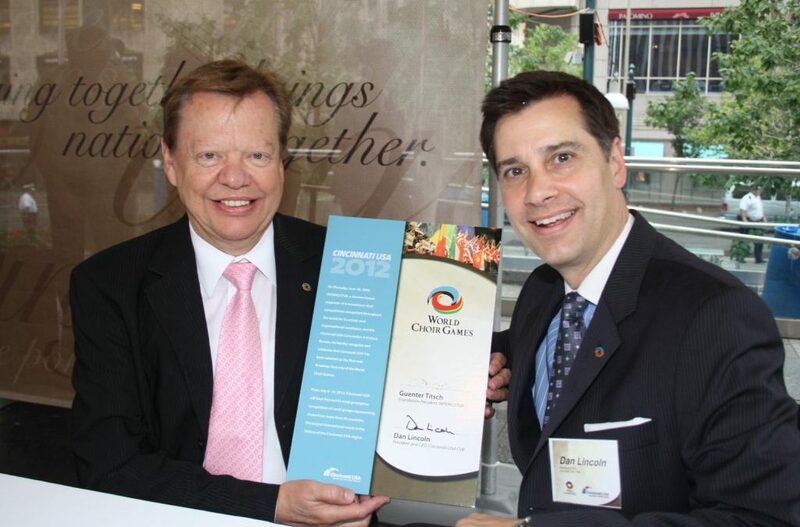 Dan was the leading figure in bringing and delivering the 2012 World Choir Games in Cincinnati. He led the team that brought this event to the huge success, that the people in Cincinnati are still reminiscing and talking about even today, 5 years later. Share Song. Create Magic. was one of the slogans of these 2012 World Choir Games. Together with Dan Lincoln and his team this slogan was brought to life in summer 2012: Songs of choirs from all over the world brought thousands of magical moments to Cincinnati and its residents. Also in the following years after the World Choir Games, Dan Lincoln and INTERKULTUR kept a good contact, and more than once he supported the organization with valuable advice. Since 2006 Dan Lincoln holds the presidency of the Cincinnati USA Convention & Visitors Bureau and looks back to a story of success. Many institutions, organizations and public figures in Cincinnat are currently expressing their personal gratitude about his numerous achievements, which helped the city to build an excellent international reputation.